and films . 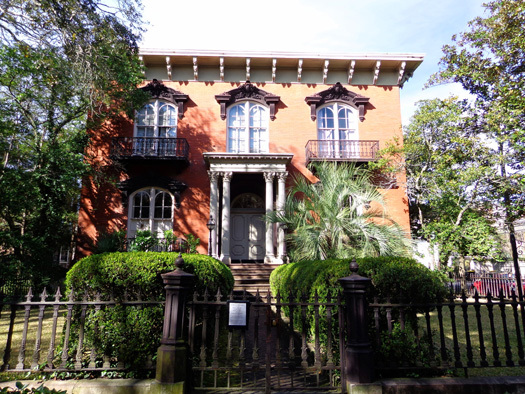 . . To truly experience Savannah, park the car and get walking!" 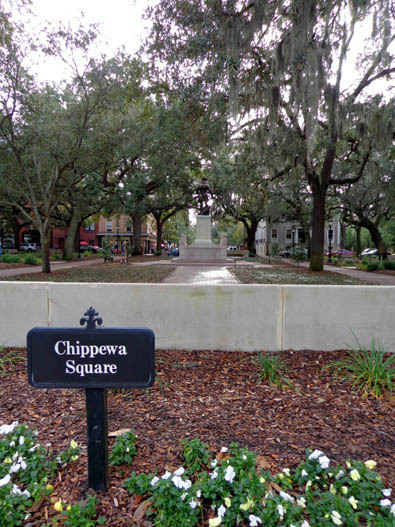 Great advice for cities like Savannah, Georgia and Charleston, South Carolina -- to most appreciate the architecture, gardens, park squares, old cemeteries, monuments, and relics in their historic districts, visitors really need to walk around so they can see the unique details. The period houses are gorgeous and the city is far enough south that some type of flower is blooming even in January (camellias, for example). 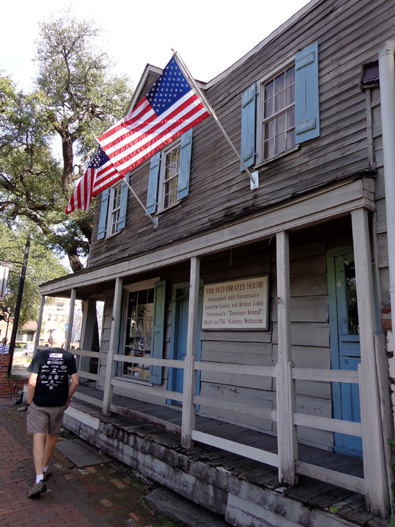 Founded in 1733, the city is a goldmine for history buffs of all types. While we've been in Savannah Jim and I have been to the Historic District five or six times to explore. There are so many notable houses, churches, and other buildings that I can't name all the ones I'm including in this entry. I'll identify only the photos I'm fairly certain of. Although I visited Savannah several times during the 25 years I lived in the metro Atlanta area, it has been a couple decades since I've been here. I'd forgotten more details than I remembered. This is Jim's first time to visit the city so we both saw it with fresh eyes. 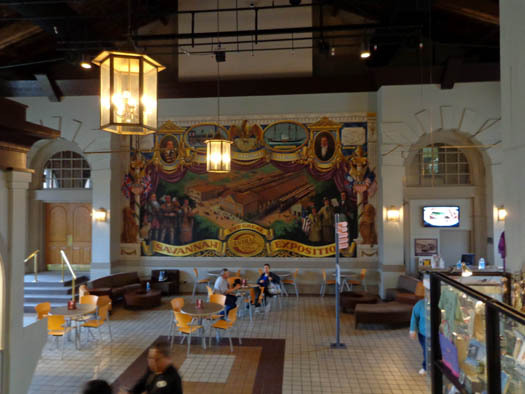 The visitor center is housed in a handsome red brick building that was built in the mid-1800s and used as the passenger terminal of a railroad for over 100 years. When we went back outside we talked with two different trolley tour operators waiting in the parking area, drumming up business. We decided that a narrated trolley tour would be a good way for us to get an overview of the historical district before setting out on foot. That way we could zero in later on particular areas where we wanted to focus our attention. A tour bus slowly wends its way through the Historic District. Each of these companies has several tour options and prices. Because it was late afternoon on a cloudy Thursday and they didn't have a lot of customers, the prices they offered were lower than normal. It was too late that day for us to be interested in a tour so we just asked some questions and didn't buy tickets yet. 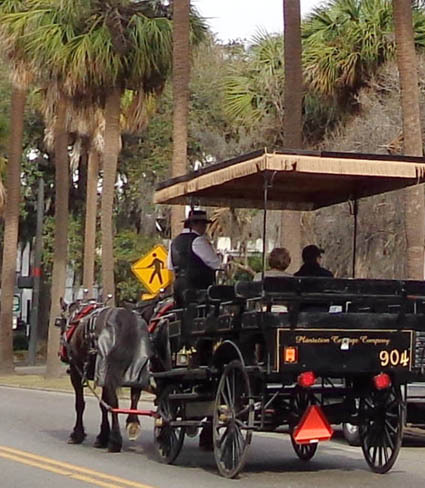 Note that horse-drawn carriage tours, such as the one shown in the photo above, are a personalized and romantic way to see Savannah but are more expensive than trolley tours and usually don't cover as much territory. The next morning, a Friday, was sunny and warm. We decided it would be a good day for our trolley tour. 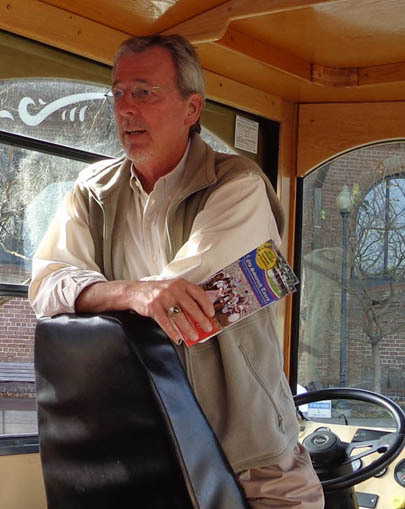 Based on the answers to our questions the day before, and the other information we read about the two trolley companies operating from the visitor center, we chose Old Savannah Tours. We parked in the company's free parking area across the street from the visitor center and got on/off the trolley at the visitor center. The old Pirate's House, built in 1754, is now a popular restaurant. 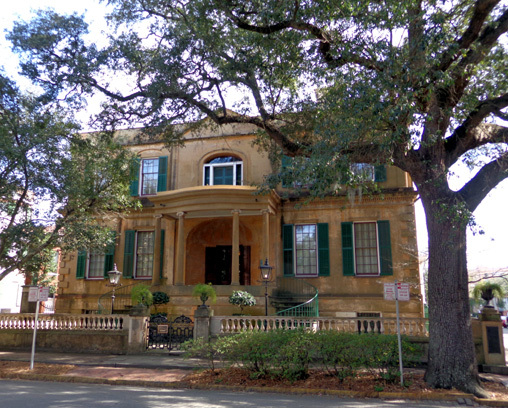 Old Savannah Tours has several tour options, including ones where you can get on/off at any of the sixteen stops along their route, ghost tours ("hauntings"), tours that include the Pirates' House restaurant or a tour inside the Sorrel-Weed House, and others. We chose the basic 90-minute "Overview" tour so we'd see a larger area of the Historic District. 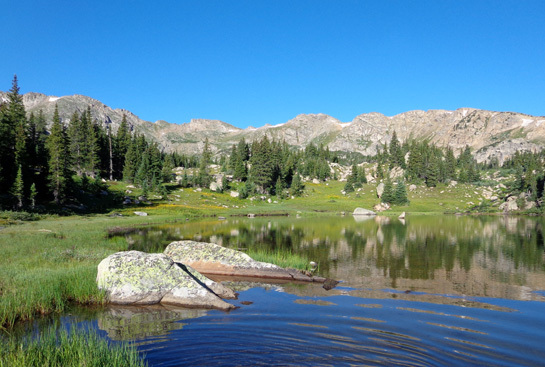 The regular price of this tour is $26/person. Our military rate was $15 each (even on a sunny morning) and we felt like we got our money's worth. Our older trolley driver/tour guide, also named Jim, was excellent -- very articulate, with a lot of information and some humor. Jim was an excellent driver and tour guide. 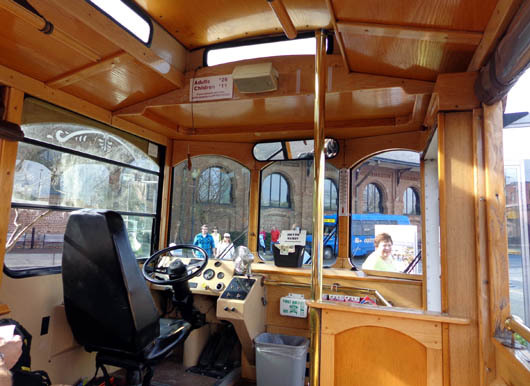 This tour stops briefly at sixteen places for passengers to get on and off, if they want. We didn't get off anywhere because we planned to go back to several of the places later to explore further on our own. While stopped, the driver gave us information about the surrounding area. In addition, he talked quite a bit as he drove past various notable buildings and squares. At two of our stops a young woman in period dress got on the trolley and gave a five-minute presentation. 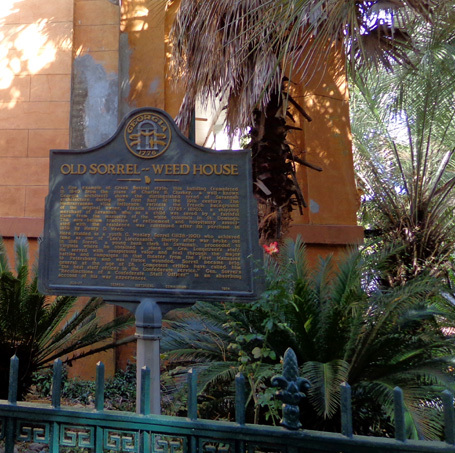 One was the Sorrel-Weed House and the other was on River St.
We enjoyed the open-air trolley, which held about two dozen people. We sat on the non-drivers' side, which was best for pictures of houses and other buildings but not the park squares. Those were on the driver's side during this tour. About these squares . . . 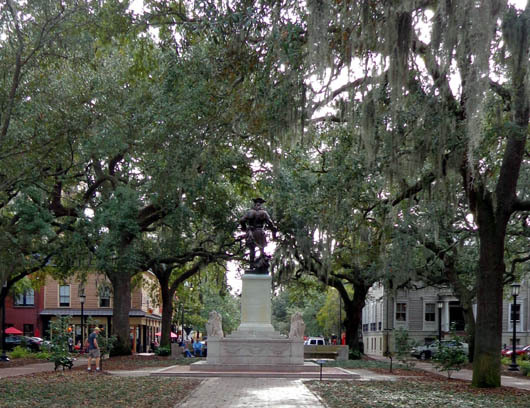 When General James Oglethorpe and Colonel William Bull laid out their new settlement in the early 1730s they centered all the residential and commercial buildings around 24 public squares, which became lovely parks full of trees, grass, fountains, and statues. in a scene in the movie, "Forrest Gump." Twenty-two of those squares remain today. 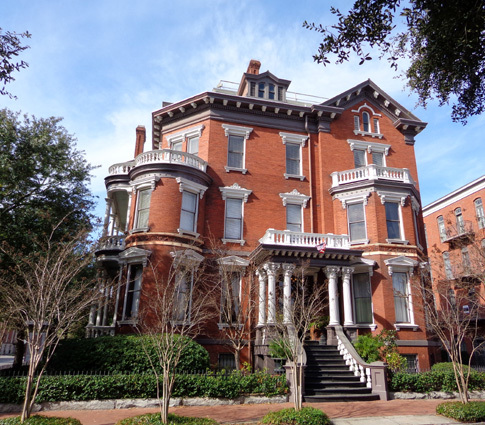 They are surrounded by the beautifully restored homes for which Savannah is famous. We drove back to the Historic District several more times after our trolley tour to explore the area on foot and in our vehicle. It would also be nice to tour the District on a bicycle. 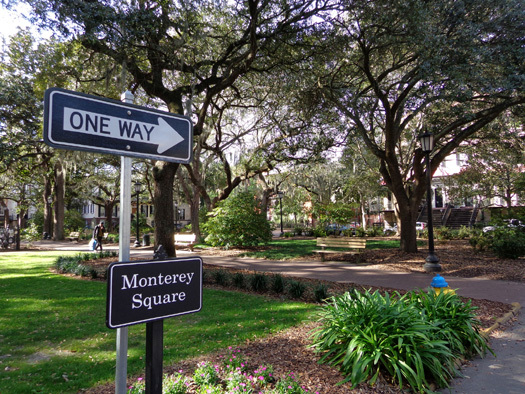 Historic Savannah is pedestrian-friendly -- more pedestrian friendly than car- or truck-friendly because of the narrow streets and difficulty finding parking. You can join a narrated walking tour or just park somewhere and start walking on your own. When you strike out on your own it helps to get a walking tour map at the visitor center first, or at least read tour guides and free promotional material about the history and architecture of some of the houses and other things you'll be seeing. 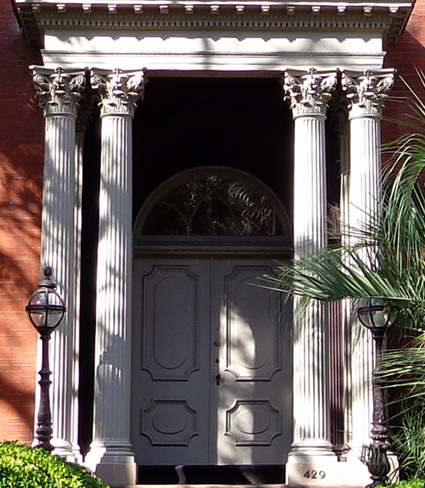 Stately Greek columns define the entrance to the Mercer Williams House at 429 Bull Street. Sometimes we followed tour maps part of the way. Other times we just picked a street, found a parking place, and started walking. You can also learn-as-you-go. Some old houses and buildings in Savannah have signs out front with information about when they were built, the architectural style, who designed the house, who lived there originally, etc. While walking we were able to focus on interesting architectural details, little gardens mostly hidden from the street, and other things we missed when driving or riding the trolley. 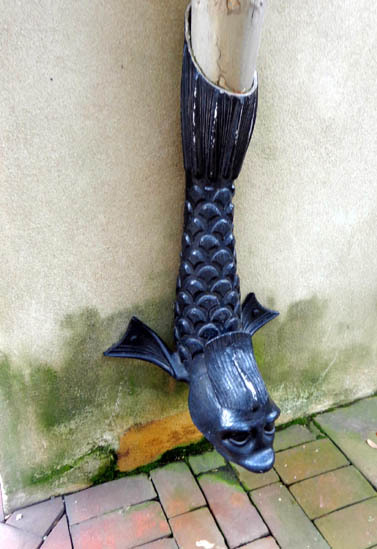 Each front corner of this house has dolphin downspouts. 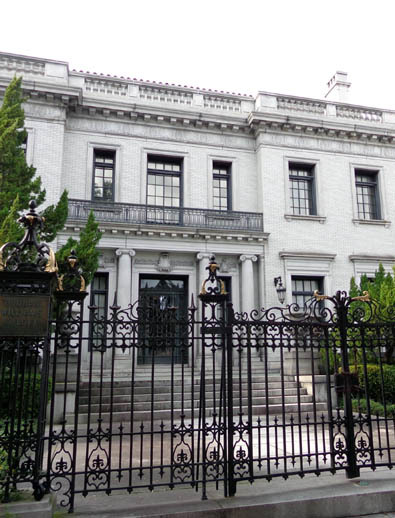 A few of the grandest homes offer interior tours for a price, if you want to see inside. We didn't pay to go into any houses on this trip. Jim wasn't interested and I've already seen enough elegant old homes in my lifetime. About the only one I'd consider visiting again is the Biltmore estate in North Carolina. Grand houses don't get any bigger or more elegant than that! 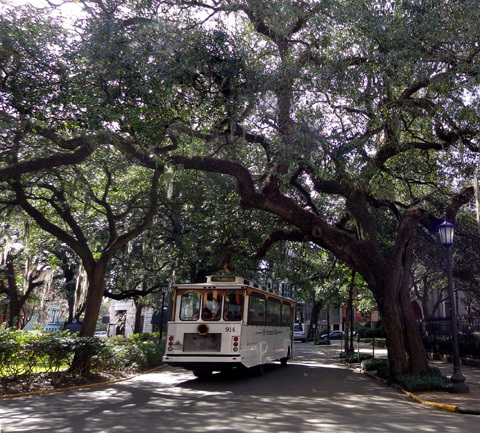 If you don't have time or are unable for other reasons to do a walking tour of Savannah's historic area, I highly recommend you take a carriage or trolley tour with an experienced driver who can describe what you're seeing. I think that really enhances the experience. Some of the streets around the squares in the Historic District are one-way. You can also explore the Historic District in your own vehicle. The downside is that old neighborhoods with narrow streets can be difficult to navigate and the driver can't see much of anything while driving. 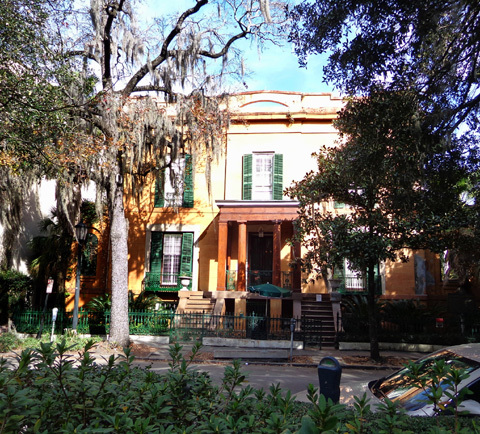 I managed to take quite a few photos during our trolley ride, driving tours, and walking tours of the Historic District. I'll share more of them in various categories below and on the next two pages. 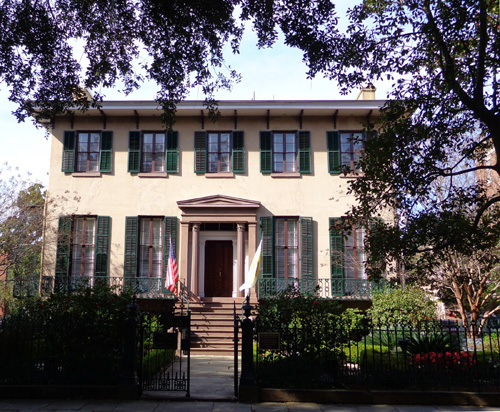 You might be wondering how there can be so many beautiful old houses in Savannah after Sherman's devastating march to the sea during the Civil War. The city got lucky there. His troops destroyed most of the old cemetery where they were quartered while occupying Savannah but they didn't destroy the houses. 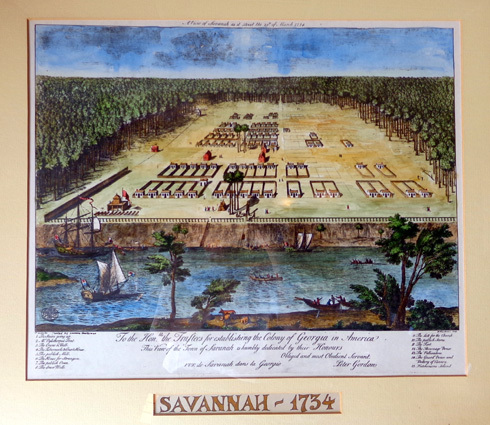 However, Savannah suffered four huge fires in the late 1700s and early 1800s. After that, fewer wooden houses were built; most were constructed of brick and stone. During the trolley tour our guide talked about historic preservation and restoration efforts made during the 20th Century. 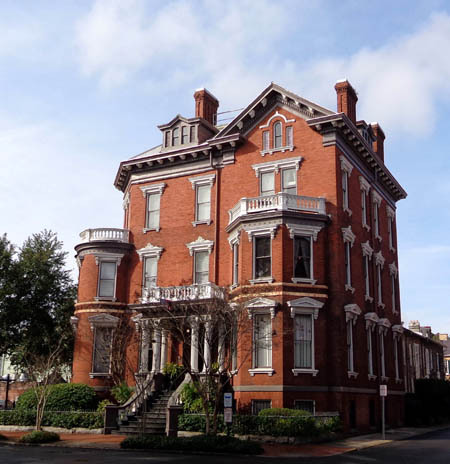 We can thank the tireless efforts of the Historic Savannah Foundation, one of the country's first and most successful urban restoration projects, for these magnificent houses and other civic restoration done to the warehouses and cotton brokerage offices on the city's historic riverfront. 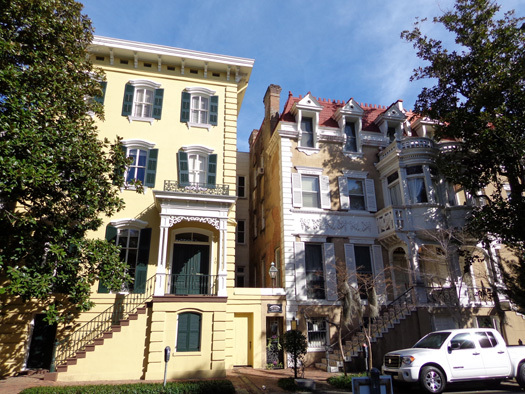 Even today there are strict rules re: what owners can do to the exterior of their homes and businesses in the Historic District, even if all they want to do is to repaint the same color! 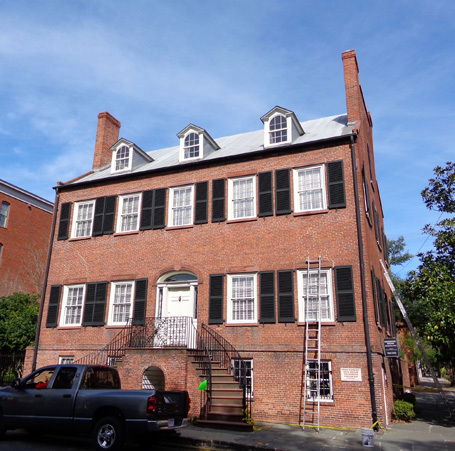 The Andrew Low House, stuccoed brick Italianate style completed in 1848, is now a museum. 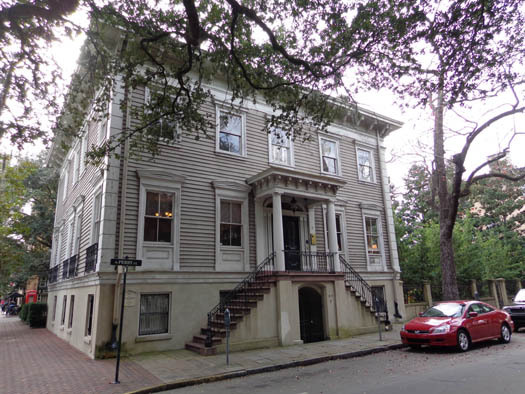 Every time it needs to be painted, the owners need the approval of the historic foundation. Some residents object to all the regulations but the rules have definitely helped the District to maintain its character and continue to draw tourists from around the world. 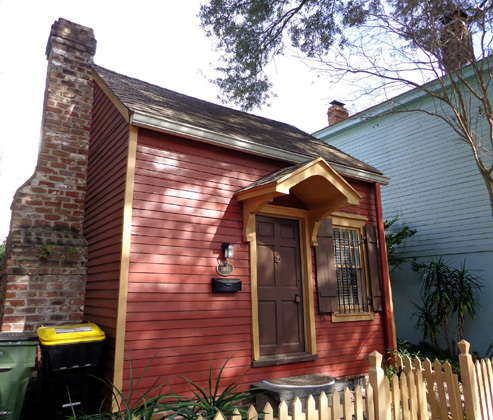 Here are more photos of interesting houses in the Historic District. Some are private homes. I'll identify the ones I know are open for public tours (for a price). You can read more about them by doing an online search. This house was designed by renowned architect William Jay when he was a mere 20 years old. It's described as one of the finest examples of Greek Revival style from the English Regency period in the country. The house was built over a four-year period of time for Richard Richardson, a local merchant, and completed in 1820. 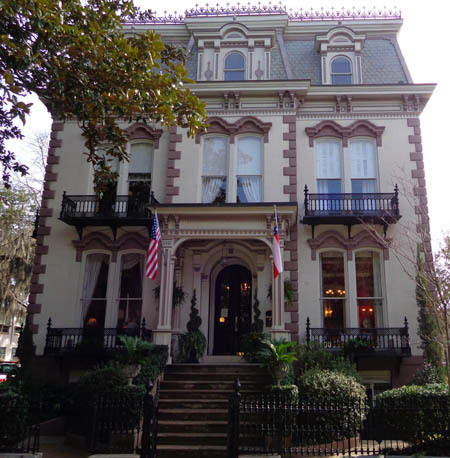 This mansion was built in 1860 and is known today for its scenes from the movie, "Midnight in the Garden of Good and Evil." 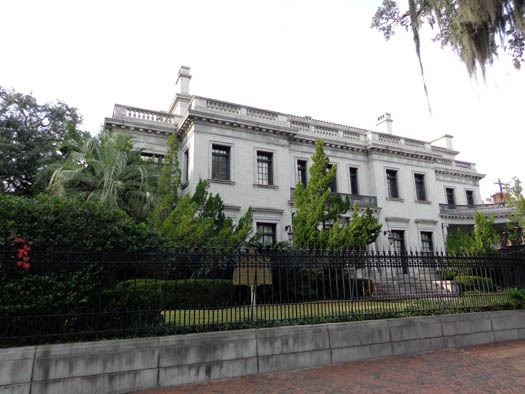 Many Savannah homes have intricate wrought-iron fences and gates. That is one of the more elaborate ones. It is dwarfed by the large homes on either side. Can you imagine what some of the mansions in these photos are worth?? 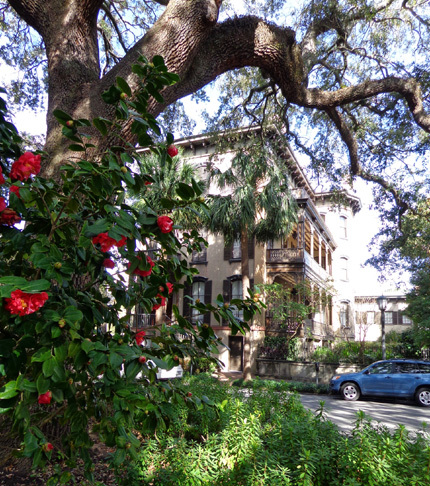 View of a house from one of the squares; not the flowering camellias.